A ukulele is a well-known string instrument that closely resembles a guitar. It is, however, smaller and has only four strings as opposed to six. If you want to tune your ukulele so that is is closer in tone to that of a guitar, you can do so by tuning the four strings to the exact pitch of a guitar's bottom four strings. You can do this quickly and easily. Turn on your digital tuner and place it on a flat surface. Strike each string on your ukulele individually and write down the note that is displayed on the tuner. Tune each string to the correct pitch. The strings on the ukulele, starting from the thickest to the thinnest string, should be tuned to the notes DGBE. 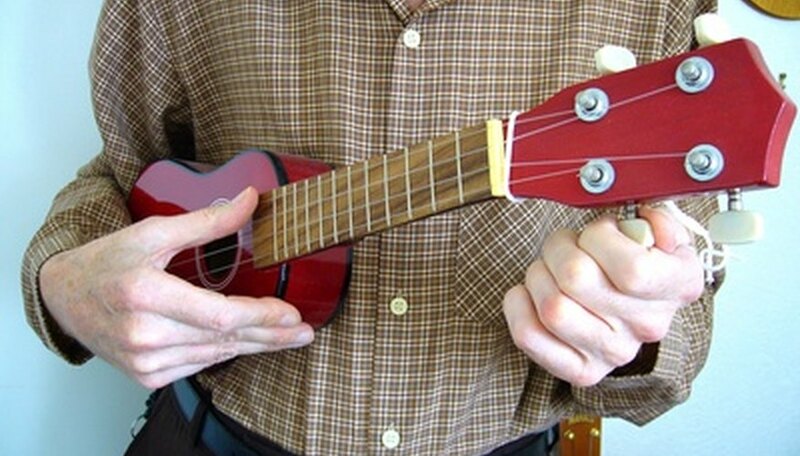 Adjust the tuning pegs on the ukulele until the pitch for each string is correct. Since a ukulele is typically tuned higher in pitch than a guitar, you will most likely need to de-tune each string to the correct pitch. Strike the string continuously while adjusting the tuning peg and watching the display of the tuner to guide you. What Are the Letters for Guitar Strings?